I cannot think about my disability identity and my love of science fiction separately. They arrived in my life together. While some people have loved SF since they were children or teens, I’m a late bloomer—I didn’t start seriously engaging with SF until I was in my mid-twenties, which was also when I experienced a major health crisis. Both SF and being sick changed me forever. Since I was unable to leave the house or work for any extended periods of time for the first years of my chronic illness, my partner and I began watching a lot of Star Trek. We decided that we would start with the Original Series and watch every episode of every series (including the films) in chronological order. By the time we got to the Next Generation, I had branched out and was reading all the cyberpunk and feminist SF I could manage. From that point on, I knew whatever I was going to do with my life was going to involve SF. Chronic Fatigue Syndrome and mental illness, most significantly generalized anxiety disorder, means that I am not able to get out of the house as much I would like. I spend the majority of my days alone (if I did not have my partner, I’d probably spend most of my evenings and weekends alone, too). Even though I am well-loved and supported, my lack of regular face-to-face social interaction can make me feel isolated and lonely. 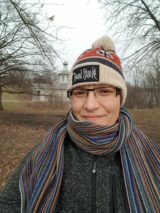 Science fiction fills not only the time when I am unable to work, but also my desire to connect meaningfully with other people. For me, SF is not just books and films; it is a community built on shared interest, and at least for the one with which I associate, a community that embraces people as they are. All of the new friends I’ve made in the past five years have been fellow SF fans and scholars (and most of them are disabled—as many other disabled have people said, we always seem to find each other!). My life is undoubtedly richer for having discovered SF (both the good and the bad). I’m constantly awed by the power of SF to bring ideas and people together, both in online spaces and in the physical world. Accessing the Future, the disability-themed short story anthology I co-edited with Djibril al-Ayad, would never had happened if Twitter hadn’t brought us together over tweets about feminist cyberpunk. When I attended the Worldcon in Reno I didn’t know anybody in fandom—after a random hallway conversation about feminist SF, I ended up meeting several amazing authors who quickly gave me the lowdown on how to navigate cons, recommended new books to read, and perhaps most importantly, encouraged me to pursue my own work in SF. While I have learned that I don’t do well at large cons, I’ve become good friends with some of those awesome people, and we now support one another through email, Skype, and snail-mail letters. This is why movements like #accessiblecons matter, why projects like Disabled People Destroy Science Fiction matter. Disabled people have always been a part of the SF/F community. Despite barriers (both cultural and environmental), disabled authors and fans have showed up and pitched in. One of the key rallying cries of disability activism is the recognition and celebration of interdependence (not independence) because no one truly survives by their own labour and effort (think about the roads you use to get around, the food you eat, or the electricity that powers your house—these are organized communal works). Disability is not something new to SF but it is something that needs better accommodations at cons and better representation in its narratives. SF is a testing ground of possibility as it reflects what (and who) we think is important today. For this reason, I particularly dislike SF narratives that erase disability in future worlds (usually through genetic engineering or other invasive medical procedures). The message such stories tell us is clear: the future is not for you because you shouldn’t even exist now. That hurts. As well, because there will always be people with different levels of ability, such visions of the future are unrealistic. It is important that we talk openly about disability and make sure that disabled people are involved in the conversation. Disability is not a one-size fits all identity, and disabled people experience varying types of barriers and privileges that intersect with race, nationality, class, gender, and sexuality. 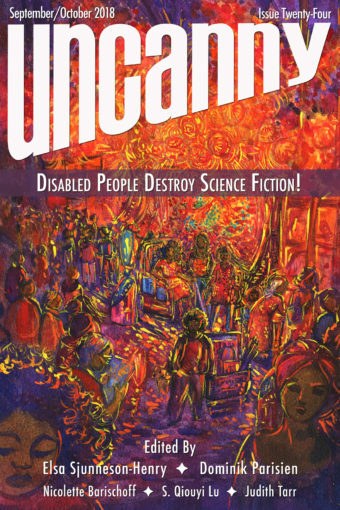 There are still so many stories about disability to tell in SF! The stories I long to see should not only reflect me, they should reflect the disabled people I know and love as well. I want characters who use canes, who are neuroatypical, who carefully measure out their energy, who need to check the menu for allergens, who take multiple medications—and I want these characters to be as diverse as the world’s population is today. I want utopias that include disability in all its forms (because if we can imagine a world like Zootopia, where animals of all sizes and from all biomes live together, then surely we can imagine some equally amazing adaptive cities for people). I want to watch SF films where disabled characters are three-dimensional and played by disabled actors. These types of stories are wanted and needed. Because representation matters. Feeling like you belong to a community, or at least feeling like you have a community to go to when you are up for doing so, is important. Both in the real world spaces of today and in the far flung futures of our imaginations, I believe that SF can be this place.